Aimed at travellers, web software LingoHop takes learners through question-answer pairs used commonly in conversation as opposed to introducing them to rudimentary words and phrases. Learning a new language is on most bucket lists and resolution reminders, and unless you’re Tim Ferriss, you’re probably having a hard time checking off the entry. Joining the likes of Rosetta Stone, Duolingo, and Babbel in helping people realize their dreams of multilingualism is LingoHop, a web software based on the latest research in linguistics. 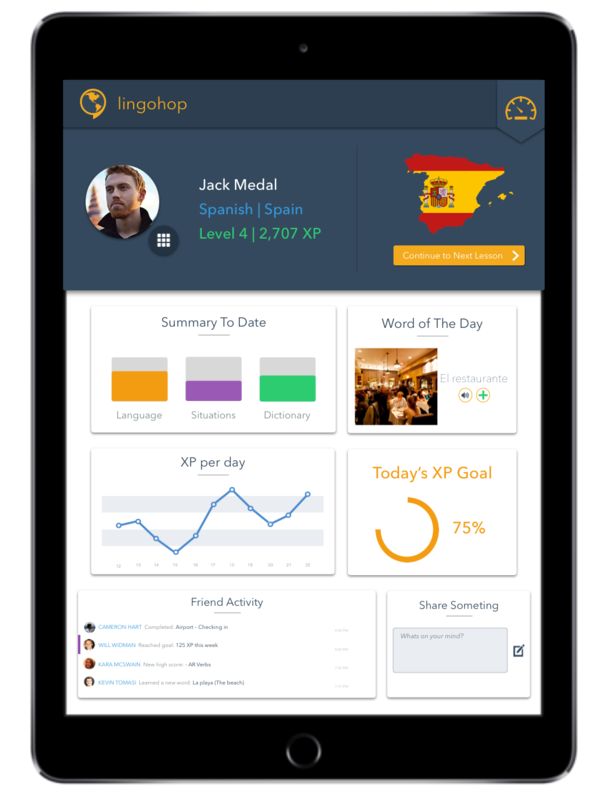 LingoHop differentiates itself from other language-learning software by offering instruction that’s personalized to the context in which each user is studying their chosen foreign tongue. For example, a student using the application to prepare for an upcoming foreign exchange trip will be put through a different regimen than a business traveler hoping to communicate with clients without the help of a translator. This approach differs significantly from the methods employed by other apps in the language-learning category. For example, Duolingo starts learners off by listing some of the most common words in each language, such as those for man, woman, water, food etc. The complexity of the content increases gradually, until users reach a stage where they’re able to string together sentences based on their knowledge of words and phrases in the language. Duolingo is extremely effective in its own right, and has enabled many to pick up second and third languages. LingoHop hopes to do the same, but by using contextual conversations instead of rudimentary words and phrases that may rarely or never actually be used in (your) real-world interactions. On enrolling for the service, users are asked to define the purpose of the undertaking; business travel, studying abroad, learning for fluency, etc. If you’re planning on studying abroad, for instance, your goals may include being able to communicate with classmates easily and fitting in with a host family. The software takes these goals into consideration and personalizes its didactic methods based on them. In the actual learning process, users are guided through 4-minute long lessons. Each lesson focuses on one specific kind of conversation. If you’re about to embark on a study trip abroad, the lessons will focus on asking for directions to school, introducing yourself to the class, etc. Since conversations are generally initiated with a question, the lessons are organized in question-answer pairs using both auditory and visual cues. LingoHop is currently under development and is being made available through a KickStarter campaign. The project has managed to raise almost $10,000 so far and has just under a month to reach their $25,000 goal. A $25 pledge rewards buyers with full access to the software and all supported languages for a year. The $45 Adventurer package comes with lifetime access to LingoHop and exclusive lessons. The platform will offer tutorials in Spanish, French, and English on launch. Additional languages such as Italian and German will be added if the KickStarter campaign reaches $50,000 and $150,000 respectively. Awesome. In the time it will take me to learn another language, I could be getting ready to study abroad. I really wanted to learn a new language and things like Rosetta Stone just were not for me. I would gives this a try as the process seems to be easier. I love this. I know there are other options, but after reading through the proposal, this really seems like it could teach you a little quicker. Very cool. For just $45 you can get lifetime access? That is incredibly cheap!